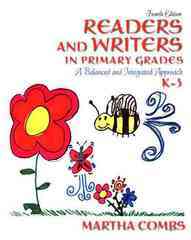 Readers and Writers in Primary Grades 4 Edition Readers and Writers in Primary Grades: A Balanced and Integrated Approach, K-3 uniquely focuses on the skills and practices reading teachers use to ensure that every child learns to read and write in the primary grades. A model of an integrated framework at the beginning of each chapter displays where reading components fit in a comprehensive reading program, as well as brief but concrete explanations of the theory behind this instruction. Thoroughy presented are the processes and procedures needed for integrating reading and writing into daily classroom practices.